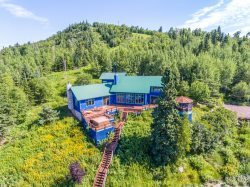 Blue House is a recently updated luxury home located on Lutsen Mountain with a views of Lake Superior from nearly every room. My husband and I brought our teenage daughter here for a weekend getaway. We stayed in #6 which is very charming and comfortable. The kitchen is well appointed so we made meals there. We loved the walkout and the fire pit was lit so we could roast marshmallows in the evening. Right on the lake, we listened to the waves while enjoying the stars. We had such a relaxing stay we're going back soon. We loved the location! Central to many great parks and of course Lake Superior! We spent a lot of time exploring nature and then enjoyed coming home to the cabin to relax and cook up some great meals! We highly recommend this place! Loved the home, it was beautiful and well kept! Great location as it is close to highway and Lutsen. Would definitely book again. The only downfall was check out at 10am, people are on holidays and it would be nice to have a check out of noon or 1230. A beautiful location with a gorgeous view of the lake. Convenient location with easy access from Grand Portage to Toffe and the Gunflint Trail. We stay all over the north shore this is one of the best spots. LOVED the updated bedding!! Simply gorgeous!! The rental was so nice and in a great location! Plenty of space and such a cool place to stay. We would recommend this to anyone and will definitely stay here again! My friends and I had a wonderful long weekend stay at Nordkapp! We especially appreciated how well equipped the kitchen was since we cooked all of our meals there. The photos were fairly accurate, but a couple updates have been made (nice HDTV and new living room recliner). We loved taking saunas and the wood stove was so nice to use in the evenings. The property is close to others but it still feels fairly secluded which is a huge bonus. The only bummer was our inability to connect to the wifi the entire weekend, even after contacting guest services. Overall we had a fantastic time and I wouldn't hesitate to rent this cozy cabin again. Good location for Lutsen skiers. Nice lake view. Very clear instructions on how to enter the house, set up heat, tv, etc. The home was so well appointed and very clean. Our family stays on the north shore every year for thanksgiving. While we liked the home and layout - we did not like the grounds - there was no hiking anywhere, so we won't return. The photos online did not do justice. AT ALL! If you had better photos, you'd probably get more reservations - for example, you have no photo of the view out front window!! Loved it. Location was outstanding. Right on the shore. With miles of shoreline to walk and explore.I don't think you can get any closer to the shore. The cabin was fantastic. Built "Folk School" style with log timbers. using no nails and screws. Very impressive. You could tell the construction of the cabin was a labor of love.We liked Agate Beach Cottage so much we have already booked it for a return trip this summer! Staff was really gracious to allow us to enter the home early. We had unexpected arrival time from traveling family and we would have been very uncomfortable without the warmth and comfort of Robin's Nest available to us. Thank you. The house is charming, the fireplace really great. The Chateau Leveaux was phenomenal! Everything you could possibly want and more at a pet friendly rental property. I honestly can't think of anything that would have made our stay "better." The access and views of the lake are incredible! The couple who ran the Chateau were wonderful and fun to talk to, as well. Go Cowboys! Could not imagine a better setting, nor a house with more perfect accommodations. We brought my parents from Grand Marias for thanksgiving dinner and everything was perfect. The lake symphony outside the windows made it a dinner to remember. It was absolutely wonderful! We barely left our unit aside from making a trip to Grand Marais for grocery shopping and to check out the pool and sauna on site. It was so cozy and clean. Didn't hear a peep from any neighbors but the people we did encounter were friendly and helpful. We stayed at Heaven Sent. In the case of a snowy winter, It would be nice if you would mention to the people staying there that if they have just a regular car without 4-wheel drive that you do not drive all the way down to the cabin. The car was unable to make it back up the hill and out onto the highway. It took a very long time with many people to push our car up the hill and out. Of course, on the way in we saw cars parked at the top of the driveway at the edge of the highway but did not really make the connection until we got stuck below that that is why we saw those cars like that. It is hard for us to know how long and steep the driveway is until we were halfway down and then it was too late. Otherwise, it was a pleasant stay. The home was absolutely beautiful and its location near the lake was priceless. As the big storm rolled along the coast we really enjoyed sitting at the line of windows and watch as the waves came crashing in. My partner had never seen the lake like that before it was wonderful seeing her in awe over the power. The privacy , even in the winter with no leaves remaining on the trees was most excellent. Coming onto the property even with the steep driveway was of little concern even though there was snow and ice. We saw no blue sign marked with number 40 but figured out our place easy enough. Inside was great however there were few supplies to make a fire in the cabin with no kindling to speak of. Had to wait til day two to get that going. Made kindling using our own tools so it all worked out well. Everything needed was provided in the cabin as far as food prep, refig, and storage. Plenty of extra towels and blankets. Walk in shower with the agate borders was awesome but may have extended the shower time for a rock hound like me. The garbage requirements though I understand the possibilities of some people trashing the place, the charges stated for overlooking a piece of garbage in the house somewhere was overdone. The cans outside the house were not marked recycle and garbage and only after re reading the lengthy rental documents again did I realize the recycling was offsite. Over all a very nice experience. The check in process and rental agreement and check out process all combined seemed rather cumbersome. The time frame associated with the rental agreement posed challenges for me as I travel for work in area where net access and phone signal is sketchy at best. The process felt constricting and I found myself more than once saying I have paid in full up front that should be enough. Nearly missed the date to reply for the rental agreement. Also with he rental agreement, it was required that a software be downloaded to complete a internet signing of the document. That took an act of god as I had a company computer....enough said there im sure. Other than that I had no personal contact with any of the staff as everything was handled over the net. Check out was simple a quick call and 6 keys and we were out of there. The cabin was very nice and clean. The location is very secluded and private. The internet access was exceptional and very fast. It was very quiet and we enjoyed the trip greatly. The only item we could not find at the cabin was a snow shovel. It snowed over a couple of days and a snow shovel would have been great to shovel out some of the areas. This is the second time choosing Chateau LeVeaux for our up north getaway. We like where it is located as it is close to Lutsen and Grand Marais. The condos are cozy and we really enjoyed the wood fireplace. Things that can be added for improvement would be an exercise facility. Also the housewares could be updated and a dishwasher would be nice. This is a lovely cabin in an excellent location. We loved the fact that, while close to many of our favorite hikes and restaurants, we felt as though we were in the middle of nowhere (in a good way). Although we stayed during a relatively quiet time of year, traffic noise from Hwy. 61 was almost non-existent. The cabin is laid out to make the best possible use of the space and location, including three walls of windows looking out to Lake Superior. Our only criticism concerned the beds: they were very, very soft, and we both ended up with backaches. The main bedroom would accommodate a larger bed, as well.